Want to find out what’s going on in and around the Birmingham area? Stay updated on the latest news in our local community right here. The AmeriCorps VISTA Summer Associate program focuses on alleviating poverty in the City of Birmingham by conducting community education, outreach, and awareness related to their summer assignments. Help expand the City of Birmingham’s reach in the areas of Education, Economic Opportunity and Healthy Futures as a City of Birmingham AmeriCorps Summer Associate. How the $945 monthly living allowance works. Are wages included in the allowance? A living allowance for the time served: $472.00 every two weeks. It is considered a “living allowance” and not a wage because summer associates are considered Volunteers by federal definition. Choice between a Segal AmeriCorps Education Award or an end-of-service summer stipend. Only those Summer Associates who successfully complete their full term of service are eligible to receive the education award or end-of-service summer stipend. Yes, applicants must be between the ages of 18-24. Note: If an applicant is 17, he or she may apply if (s)he will be 18 on or by May 31st. Yes and No: The Summer Associate program is a part of the City of Birmingham’s AmeriCorps VISTA program. AmeriCorps is the national version of the peace corps funded by the National Corporation for Community Service. The program itself is federally funded, but managed by nonprofits, faith-based organizations, and municipalities across the nation. The City of Birmingham has had the honor of hosting AmeriCorps VISTAs for three years. Individuals that are selected to serve as Summer Associates will be serving with various departments within the municipality, but primarily Parks & Recreation and the Division of Youth Services. Every day 7 people die from home fires. That’s why the American Red Cross is rallying volunteers to team up with fire departments and partners to Sound the Alarm. 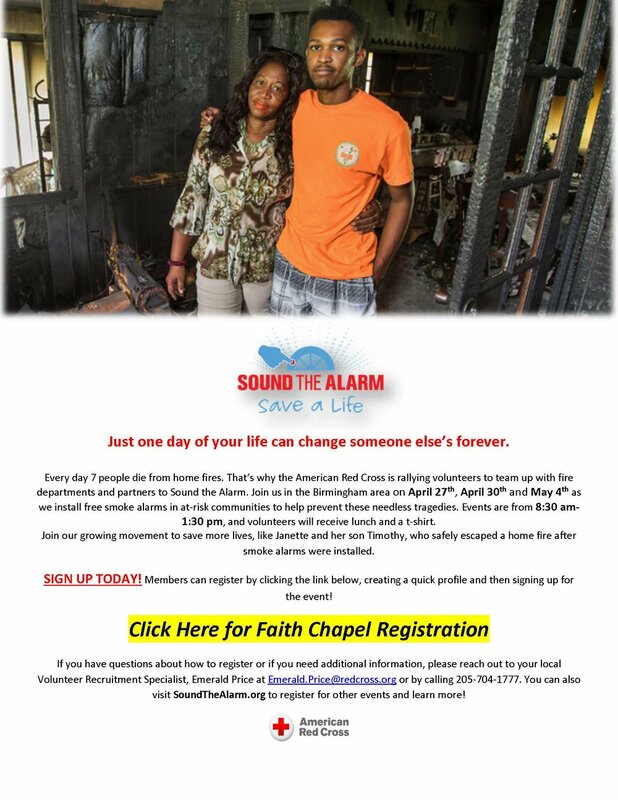 Join us in the Birmingham area on April 27th as we install free smoke alarms in at-risk communities to help prevent these needless tragedies. Click here to register. Jefferson County Department of Human Resources JOBS Program is hosting an event! Please see below for more information. Jefferson County Department of Human Resources invites you to participate in their Job Readiness Workshop! Topics include: Resume Writing, What To Wear/ What NOT to Wear Fashion Show, Successful Job Interviews, How to Keep Your New Job & Money Management! Birmingham, February 21, 2019 – JCCEO Weatherization Assistance Program is accepting applications from eligible, low-income residents of Jefferson County, AL. The JCCEO Weatherization Assistance Program is accepting applications for home weatherization services from eligible, low-income residents of Jefferson County, AL. For eligibility requirements and to schedule an appointment, please call 205-212-9604 (available 24 hours/day, 7 days/week) or visit the JCCEO website at http://www.jcceo.org. For more information, media should contact Vie Mims at [205-327-7541] or vmims@jcceo.org. Eligible for any current college students at an Historically Black College or University. $25k scholarship, internship, and mentoring support provided. CAN ATTEND ANY HBCU. HHA assistance is available statewide to qualified homeowners on a first-come, first-served basis. Click here to visit their website for more details. The American Cancer Society Road To Recovery® program offers cancer patients free transportation to and from their cancer-related treatment. For those who cannot drive themselves or have no other means of getting to treatment, volunteers donate their spare time and the use of their personal vehicle to give cancer patients in their community a much-needed ride. Prospective volunteers may contact Heather Adams or visit www.cancer.org/drive and complete an online volunteer inquiry form. Click here to learn more. Military Warriors currently has 53 Homes available for our combat wounded heroes and GoldStar Spouses. They are spread across 24 of the 50 states, including Alabama. Apply for the Homes4WoundedHeroes or Homes 4 Gold Stars today! Click here to learn more. Jeremiah’s Hope Academy (JHA) is a low-cost job skills training program that equips individuals for entry-level healthcare positions. Jeremiah's Hope offers multiple health-related training programs that are 10, 12 or 24 weeks in length. Click here to learn more.